Browsing the wonderful open content collection of the Rijksmuseum turned up several old photos of Vienna. Back then, the Graben was blocked at one end by the Elefantenhaus, leaving two small alleyways on either side. The front of the house featured an elephant in relief, commemorating Archduke Maximilian’s triumphant arrival in the city in 1552 with one such animal in tow. They removed the house and opened up the Graben in 1866. Today it’s the showpiece of Vienna’s pedestrianised old town. The monument on the left is a 17th-century plague column. Michaelerplatz sits at one end of the Hofburg palace complex. On the right of the old photo is the court theater. This moved to new premises in 1888, allowing them to tear down the building and give the Hofburg a nice finish. The Marian Column on the left dates back to 1667, the fountain in front of it to 1732. On the right is the Kirche am Hof, parts of which date back to 1386 (the front is mid-17th century). Apart from the missing fountain, not a lot has changed! This palatial building has its roots in the 13th century and was a summer residence of various Emperors. Now a school (and has been since around 1750). Palais Todesco was built in 1861, but the photo is sometime after 1874, because that was when the pictured Habig hat shop first opened. The Habig family still make hats in Vienna today. The only apparent change to the building is the removal of the double-headed eagle symbol of the Austro-Hungarian monarchy (for obvious reasons, given this is now the Hungarian Ambassador’s official residence). They completed the new Rathaus building in 1883. The photo is probably just a few years older, with a lone street cleaner in the square. Today, that square hosts numerous events, like the Vienna Ice World open-air ice skating in the modern photo. The Albertina Palace (now an outstanding art museum) sits above the fountain. The queue in the modern photo is not for the museum, but for fried sausages at the famous Bitzinger Würstelstand. The “new” statue is an 1898 bronze monument to Archduke Albrecht by Caspar Zumbusch, who also designed the Beethoven and Maria Theresa monuments. The complex survived bomb damage during the Turkish siege of 1683 and WWII. The advertisement on the left of the old photo is for a dentist, who also opens on Sundays and public holidays. Service! The palatial Haashaus on Stephansplatz, built in 1867, was actually a carpet shop. Unfortunately, it fell victim to aerial bombing in 1945. The current Haashaus appeared in 1990 and is currently home to a hotel, restaurant and shops. You can see Stephansdom cathedral mirrored in the facade. As you can imagine, there was some controversy over the suitability of the design, but it’s part of the old town landscape now. Built in the late 1870s, the Palace of Justice still houses various public prosecution offices and courts, including the supreme court. It was partially rebuilt in the late 1920s after protesting workers set it on fire in 1927. The incident was a precursor to the brief civil war that erupted in Vienna soon after. The four female figures date back to 1786 were quite scandalous at the time. Look at the bottom right window in the old photo and it seems the prospect of a photographer caused quite a stir among the inhabitants. Built in 1873, Palais Epstein is now used for parliamentary offices, but has been the HQ of the Nazi construction ministry, the Russian army and the Viennese school authorities. In the old photo, there’s a bookseller selling old books in the ground floor. 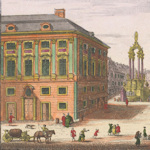 The Heinrichhof (opposite the State Opera House) provided premises for a sales outlet of the Backhausen company, who delivered carpets and other materials to the Habsburg court. Aerial bombing in 1945 destroyed the building completely. The less-extravagant new building is the Opernringhof. The Roman Emperor Marcus Aurelius once stayed on this square – that’s how old it is. All that’s left today from the 18th-century picture is the Vermählungsbrunnen fountain from 1732. Opened in 1869, almost completely destroyed in WII bombing, and rebuilt in its entirety after the war. The more things change, the more they stay the same?